Content Leaks: Call The Lawyers, Or Talk To Fans Honestly? "Thank you for bringing this to our attention. We are not associated with the US Copyright Group and they are not authorized to use Copyright Enforcement Group materials." Someone else was told that Dunlap, Grubb & Weaver will be receiving a cease & desist shortly. I wonder what sort of "pre-settlement" option will come with that letter. They can't possibly be that insane, right? There must be more to this story. Someone tell I.C.E. to seize their domain! Someone better call homeland security over this act of terrorism. They'll just blame it on some poor schmuck who created their website for them. I'm sure they'll claim they had no idea that their website was copied from somewhere else. That's true and that reasoning would probably hold up in a court of law. But in order to get content taken down that you don't like -- or in this case, copied "without your knowledge" -- you don't need to take someone to court. All it takes is a DMCA takedown notice and some bullying. Seems like copyright infringers can then claim that they hired poor schmucks to get the data for them, and everyone's in the clear. Did they even look at the site before it went up? 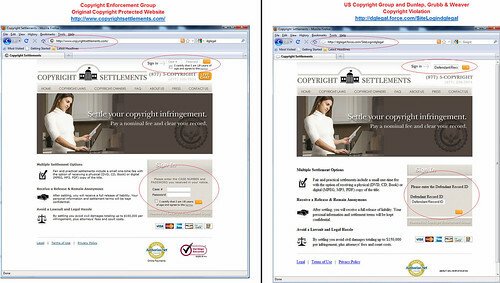 Look at the picture the watermark looking seal says copyright enforcement group. Don't care who they hired, as blatant as this is they deserve to be hammered. Unwillful infringement still carries a hefty fine ;) According to them: There's no excuse, Ignorance is no excuse, Poverty is no excuse, theft is theft. ...and yet that same defence will probably not be accepted from them from the people they're suing. Let me guess, they both developed the site independently or a honest mistake. Take your pick. 2) USCG hired a very amateur/shady web designer and told them "make it like this web site" and they took it very literally. Obviously, they see themselves as above the law. Nothing will come of this and they will continue to send out their letters of extortion to dead people, childeren and laser printers. I think Comboman has it right with his choices, but I'm more inclined to believe that it was the shady choice. Unfortunately, everyone is out to make a fast buck. nice that, in a way, these copyright trolls were hoist by their own petard! ...hoist by their own petard! I love that expression. I need to find more ways to work it into everyday conversation. "Why is it that the biggest "defenders" of copyright are always the ones caught infringing on others' copyrights?" I'll answer that one. To the copyright industry, copyright is not about protecting the work of authors, artists, musicians or coders. It's about eliminating competition and maintaining the status quo through the use of their government granted monopolies. Big players can and do infringe copyrights all they want. They can do that because they're big. At the worst even if they're sued they have the money to quickly settle. What the big players like about copyright is keeping the little guys from upsetting their gravy train. When the little guy infringes, the big guys can sue the little guy into oblivion. So, with our current copyright system, the big guys can do whatever they want and infringe whatever they want. While the little guys and consumers are forced to comply. As an example, you had a posting a short while ago about a fashion designer, who on one hand "stole" his designs and on the other hand, wanted strict copyright protection for his designs. As I explained above, there's no contradiction in that. With a strong copyright, he'd still be free to "steal" any designs he wants and then drag it out in court and settle if he has too. However, any upcoming designer would be shut out. It's a win/win for the status quo designer because it eliminates competition. Which is the real purpose of copyright. Right, all laws are applied like that now. This is the new deal. The whole DMCA thing and just about every law since, has been about the final transfer to the corporate oligarchy. Re: Biggest Defenders? What about the "Little Guy"? Copyright was originally intended to protect a piece of intellectual property for a specified number of years. A song, a photograph, etc. What has happened is it is so expensive for a "little guy" to protect a copyright that virtually all violations go unchallenged in court. How many average people do you know that have 10-20 thousand dollars just laying around to give to a lawyer to take a violator to court? It's a damn shame that parents haven't taught their kids that just because it's on the web doesn't mean that it's actually free. What really needs to happen is to reduce the cost of taking some-one to court so that the little guy can actually defend their copyrights and I'll bet that it wouldn't take long before people figured out that stealing doesn't pay. They simply mimeographed the web site. They didn't bother to change the masthead, the graphic, very little of the verbiage. How funny. It's been shown to be the case with politicians, acitvist groups... and now... apparently, copyright organizations. However, that said... it's fairly likely they bought the same website template somewhere, which is why the sites look so similiar. Cheap start-ups and knock offs of each other. I don't buy it. Canned web sites, even those targeting a particular industry, don't have THAT much similarity. I can see the masthead being the same, but not the bullet points regarding the particular "qualities" of filing a suite with the respective companies. You usually fill those in with templates. These copyright thugs are no doubt better at extortion than ethical law practice. The mind boggles. Is it possible to have a class-action suit against this firm, on behalf of all recipients of their pay-now-or-we'll-sue-you threats? Copyright Enforcement Group should sue, and claim that each page view counts as a seperate infringement. This is so comical, yet so depressing. Look at the Gorilla in the room people.. They both have the same phone number! Yeah... how stupid could they be to leave the same phone number? I was starting to think that they're just part of the same entity (two sides to the same coin and not really competitors). I don't really care about the issue, but that woman is pretty hot! If this is true and USCG got caught red-handed, then that is too feakin' funny! LMAO! Although, for right or for wrong, none of this changes the cases USCG has brought against alleged infringers. For USCG haters, this is an empty victory... feels good for a second, but ultimately changes nothing in the underlying battle. Yep, I dont see the leeches changing their attitiude at all. They will continue to accuse without evidence and make demands without reason. Embarassing. But I too have to wonder if there isn't more to the story. More hypocrisy, more lies and more BS. Pre-Settlement letter HELL NO This is a lawsuit you can retire on. It's a commercial website seeking seeking business. Not some snippet of news cut and pasted or song downloaded in the middle of the night. Also this is a business to business transaction solicitation. So no consumer protection laws or such to protect or limit liability. 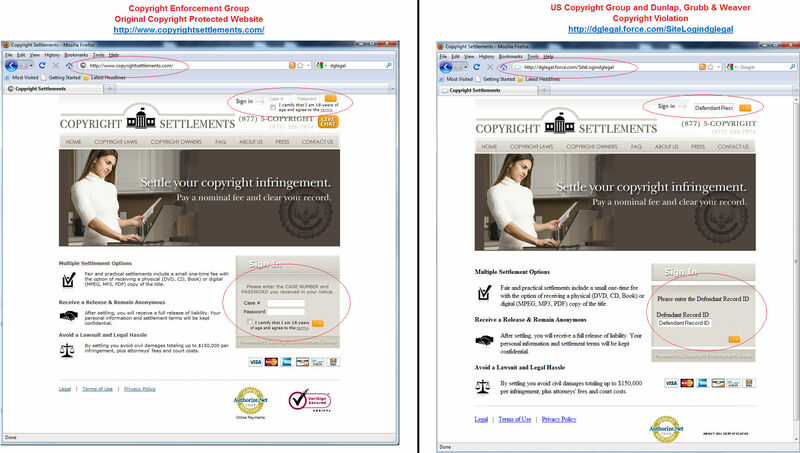 It seems as though they have maintained code for two functions checkmyform() and checkmyformb() that do not correspond to anything on their new site, but are easily identified on the copyrightsettlements.com site. And they get a bonus for leaving the word 'Placeholder' where I suppose they want a title to point out one more time that the defendant record ID goes in the box. Out of curiosity, has anyone considered the possibility that this is a setup by some unknown party? LOL, no I don't think anyone has considered that :).. Oh you were being serious. Given the tenor of the comments, it is a fair question. The devil's in the Details...??? Re: The devil's in the Details...??? They were just giving proper credit to where they got it from is all! that the IP groups don't really give a rats tushie about anyone's copyright or IP except their own. it's not really surprising; they are really in the extortion business anyway. Looks like someone is feeding all that data into a salesforce.com database too. They didnt even change the phone number. ??? That makes no sense, which is fitting. They probably "hired" some web designer for cheap after they saw the other site. The designer came up with an idea and they kept saying, "can you make it more like that one we showed you, we really liked it." After dozens of emails like this the designer got fed up and wasn't being paid much and said, "Fine you want it just like their site?" They said, "basically yes" and he said, "Here you go, their site." I can't speak for all Web Designers, but a big part of web design is finding a site that the client likes and modeling their site after it. You don't however just copy and paste the entire html. Most web designers don't care if you copy segments of their code because they most likely found code from someone else too, but to not change any of the information is more than just bad practice. That said, no web designer is ever going to put a site out live without getting the expressed permission from the client. They are getting paid whether it goes live or not so their, "but it was the web designer's fault", excuse isn't going to cut it. They are the ones who decided to put it live, not the web designer. Its their responsibility as the client to go through the pages to be sure the content is correct, not the web designer. And if they did give the web designer complete and unchecked authority on what content gets put up then they are even more so responsible for the content of the pages than if they designer had gone rogue. The dglegal site is already down or under construction.